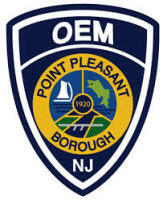 The Point Pleasant Borough Office of Emergency Management (O.E.M.) is the coordinating agency for the Borough of Point Pleasant. The agency plans and prepares for emergencies, educates the public about preparedness, coordinates emergency response and recovery, and collects while also disseminating emergency information. The agency maintains a disciplined unit of emergency management personnel — including but not limited to: responders, planners, watch commanders, logisticians, CERT members, communications, administrative and support staff — to identify and respond to various hazards and incidents. O.E.M. is a volunteer organization with the exception of the O.E.M. Coordinator who receives a minimal stipend. Members of O.E.M. come from all different backgrounds including public safety, law, medical, education and business. This diversity helps O.E.M. better understand the needs of the residents and visitors of Point Pleasant. O.E.M. is supplemented by the Point Pleasant Borough Community Response Team (C.E.R.T.) during times of disaster and response. C.E.R.T. members are trained community volunteers able to be directed and coordinated to assist residents during times of need. Receive emergency information on your cellphone! It's quick, easy and secure.